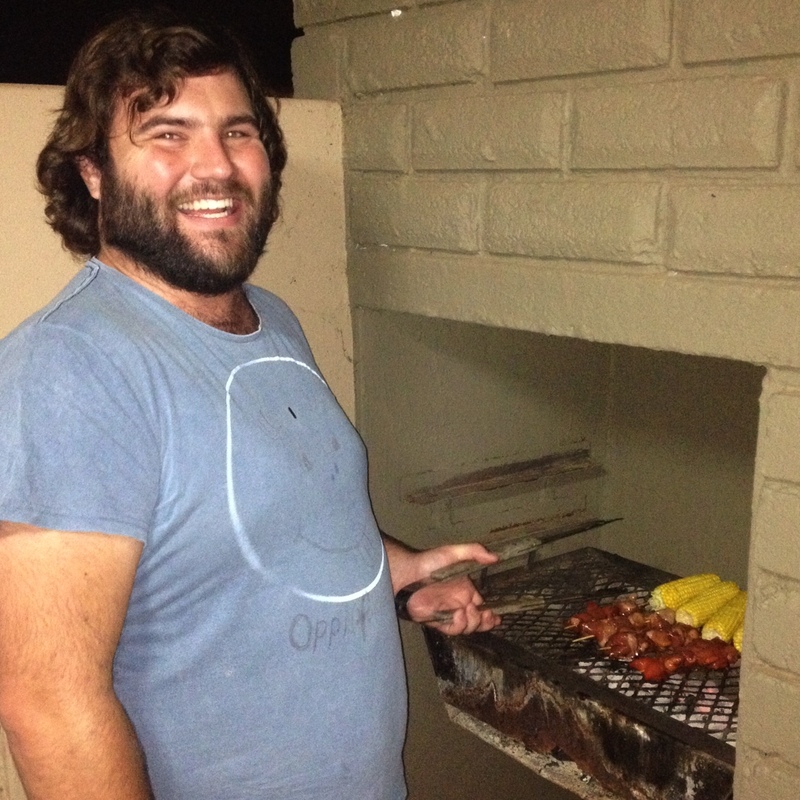 Legendary lover of The Braai, BraaiBoy, challenged a bunch of bloggers to prepare a meal for 4 people. The catch being that the maximum budget for the meal was R200. Now, R200 is a shitload 2-min Noodles. But this meal had to be awesome, so I went ahead and created Awesome. I went to Spar, bought my ingredients and surprised myself not only with good food, but also an interesting life lesson. Make sure to check your fire, should be halfway ready now, and time for another beer. Add lump of butter into pot, heat on full and add mince when warm. Quickly stir mince to brown a bit, and add water to mince level. Let this boil, stirring occasionally, for about 5 minutes. Turn down to a hectic simmer. 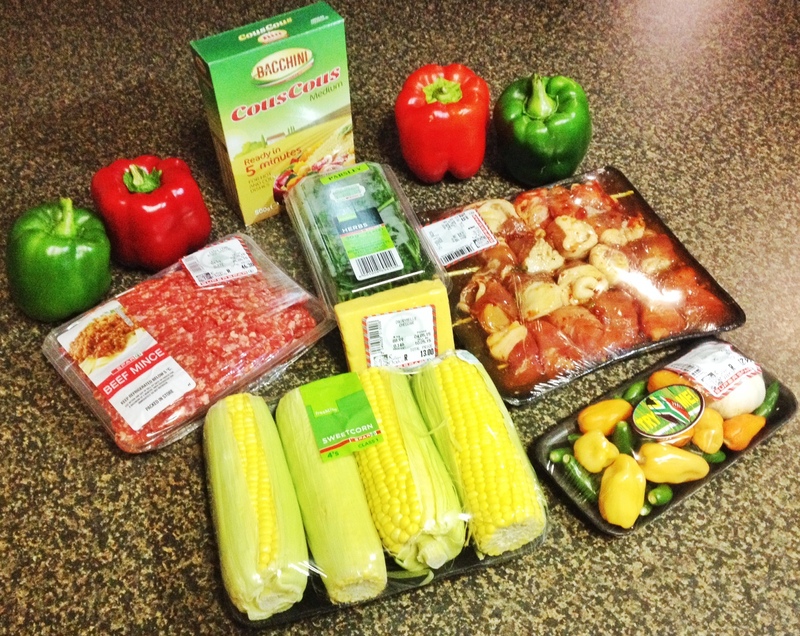 Corn – You can pre-prep them in the microwave for about 8 minutes on high, inside a clean plastic bag. This saves time on the fire, but does take some of the authentic fire-taste away. When on the fire, do turn regularly. You CAN salt the corn on the fire, but seeing as this is a quite a spicy meal, I like to have the corn as is. Sosaties – Remember, there’s chicken in there, so you don’t want to dry it out too much. You won’t get crispy bacon anyway, so don’t aim for that. When almost done, pour some of the sosatie marinade/sauce over the sosaties. While braai is happening, go back to the mince and add a swig of milk. By now the mince water level in the mince should have substantially subsided. Also add the remainder of the sosatie marinade/sauce to the mince. Taste test, and add salt if needed. Stir. Lubricate saucepan/skillet with butter, add about 1 cm of warm water (ie water that boiled, but about 5 minutes ago) and add Couscous to water. Stir, and add water as needed to get almost a mash-texture. Remember, the heat is on, stir a LOT. Add ,some ground black pepper, salt and Aromat. Don’t over-flavour, as this will be a bit of a neutralising agent for the severity of the chillies. Stir some more, until it resembles course putu pap. Remove from heat. 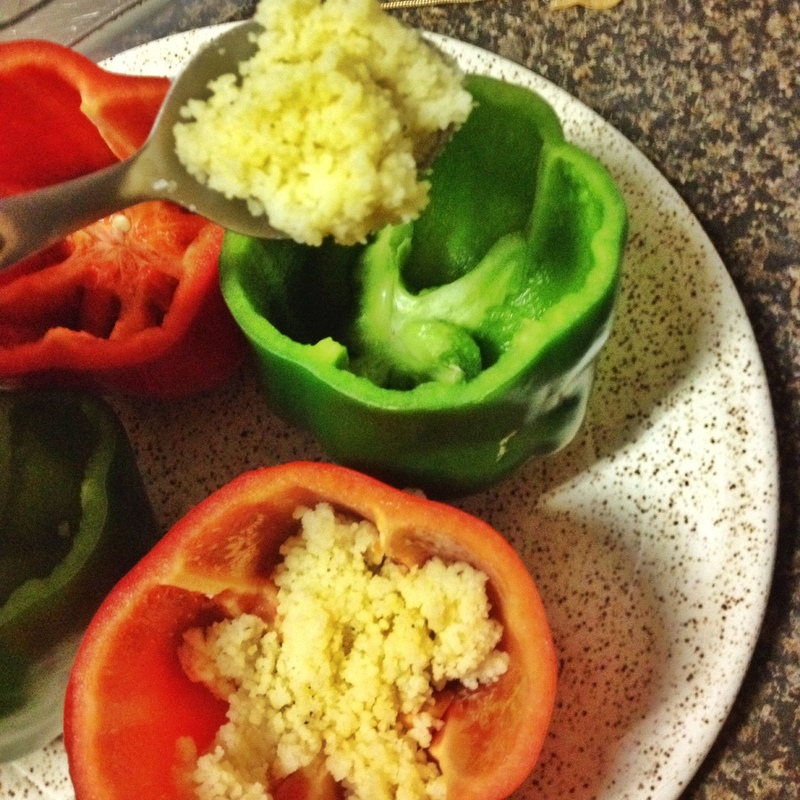 Put a layer of Couscous inside the hollowed out peppers. Not too much. 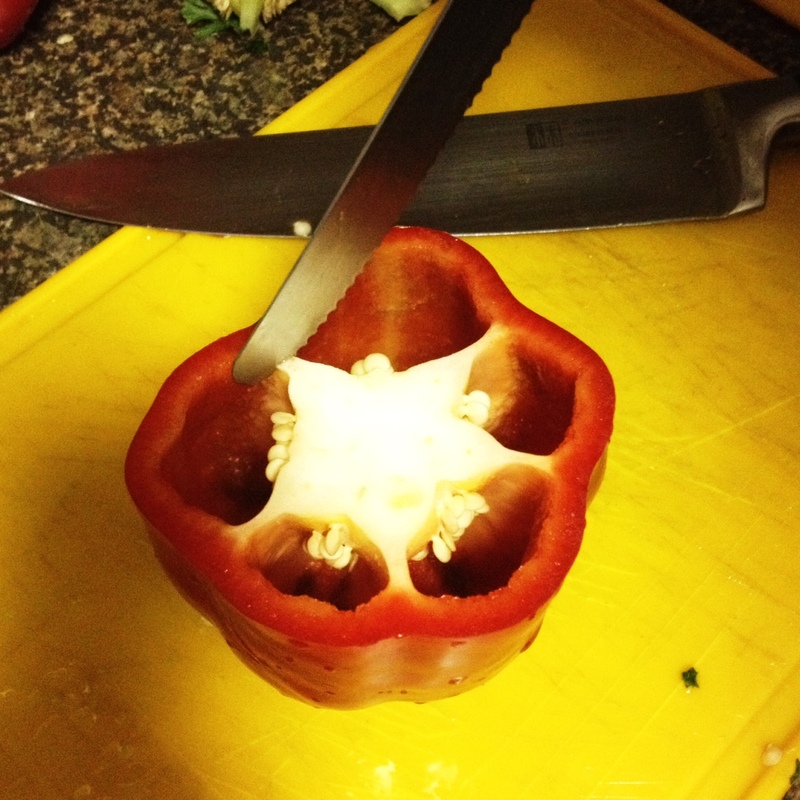 Fill peppers with mince (strain as you do, don’t want sloppy peppers) and sprinkle cheese over top. Wrap peppers in foil, put in mostly dead fire for about 2 minutes. OR, if you (like me) forgot that you didn’t have foil at home, simply pop them into the microwave for a minute, just to melt the cheese. 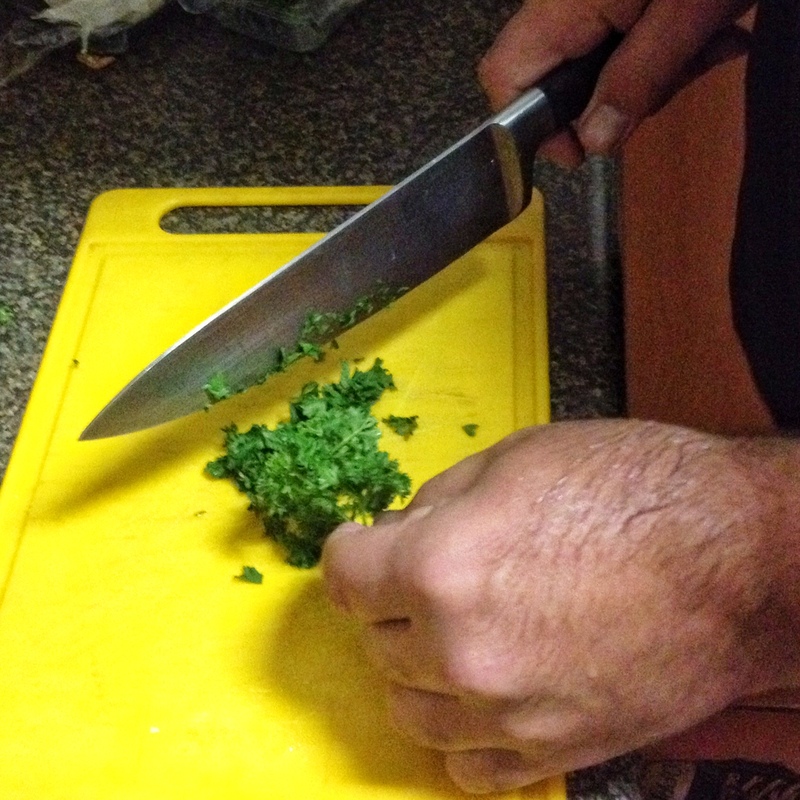 Sprinkle remainder of Parsley over the cheese. 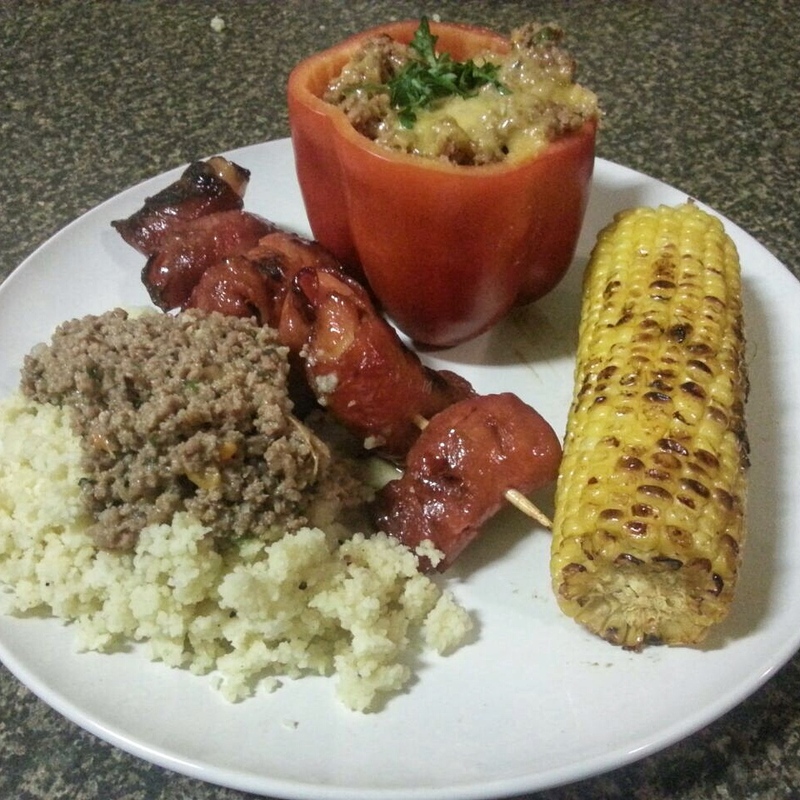 Once your sosaties are solid, and your cobs brown, remove and place on plates, alongside peppers. Spoon some Couscous and the remainder of the mince onto the plates. Voila! 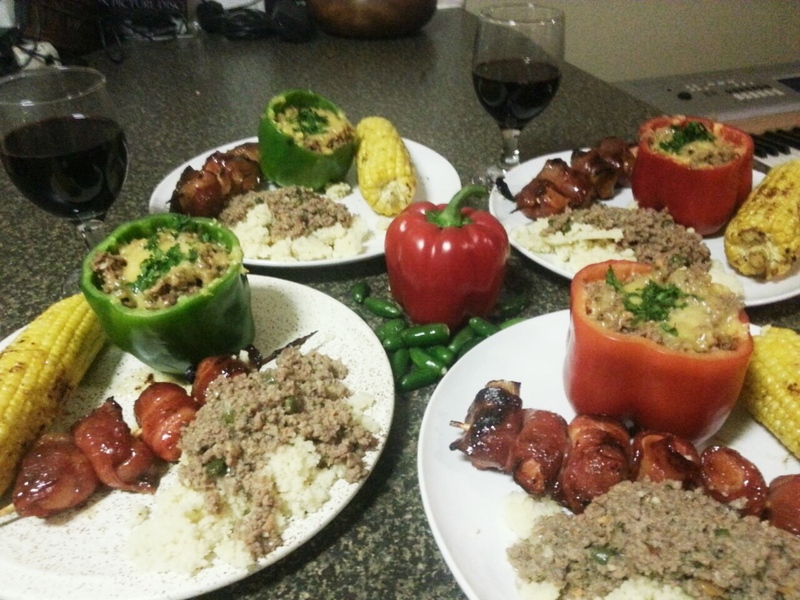 A Meal for Four for Less Than R200. My suggestion would be to pair this meal with a red wine, but not an expensive one, seeing as your very chilli mouth will not appreciate it. I went fora Café Culture Coffee Mocha 2014 Pinotage. Coz that’s what my mate Charlie brought over. The thing I realised in doing this, was that you can really prepare a decent meal on quite small budget. In real life, I would say that you can ditch the ornamental peppers, buys some more mince, corn and add an onion to the mince. 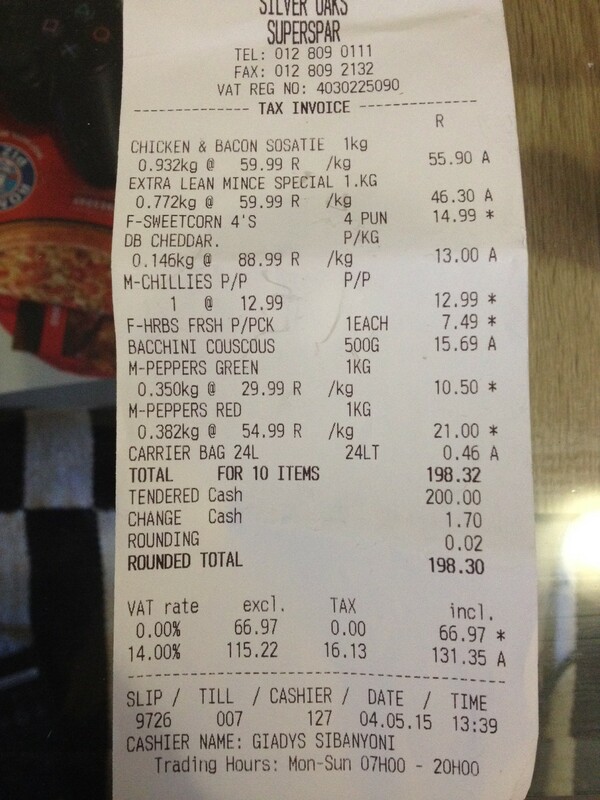 This would easily feed 8 people for under R250. As things are, I have enough Couscous, chillies, garlic and parsley left to make another interesting dish. What do you think of my first attempt at food blogging? Also, my first written recipe. Ever. Do drop a comment below and feel free to tell BraaiBoy I am awesome. You can BE THE COOLEST PERSON at your next braai by knowing what's on this blog before anyone else.